It all started in 1987 with the release of Appetite for Destruction. GN'R's debut took the rock world by storm. I was in Jr. High at the time, and got swept up in the frenzy with everyone else. The song that did the trick for me was Paradise City. I couldn't get enough of that song! My buddies & I listened to Appetite practically non-stop throughout 7th grade. Now, back in Jr. High, we were all growing boys, and our wardrobes were a bit limited. I was always eager for my mom to wash my GN'R tee shirt so I could wear it again. I usually got to wear it at least once a week. Coincidentally, one of my friends from the mall-birthday party happened to be on the same schedule as me in terms of our laundry- and we unintentionally wore our "GN'R was here" tee-shirt on the same day so often we became know as "The Guns N' Roses Brothers". At first it was kinda cool, but after a while we both got annoyed about it, and tried to guess which day one of us would wear the shirt and wear our own on a different day, and we still coincided plenty of times! At least it makes for a memorable time from my childhood. Now for Guns N' Roses' music, here are my thoughts: Appetite was such a huge hit, and the band themselves were a phenomenon, it seemed impossible to ever top that success. GN'R Lies was a kind of filler album- a handful of new predominantly acoustic numbers, an acoustic re-recording of "You're Crazy", put together with a re-release of their EP-Live Like a Suicide. It took forever (it seemed) for the band to record an official follow-up album, and when it was finished it became a double-album: Use Your Illusion I & II. The quality and effort that went into these albums was apparent, and everyone who followed GN'R knew they were trying to top the success of Appetite. The band itself was volatile-none more so than Axl Rose, the band's front-man. A final somewhat united effort resulted in The Spaghetti Incident?, a collection of cover songs-mostly of punk-rock favorites of the band members. Shortly after, Axl began firing band members, until he was the only original member left. That was in '93-'94, and the world is still waiting for Axl to come up with another studio album. The rumored "Chinese Democracy" album has had so many anticipated release dates I've given up anticipating it. If it happens to come out, then I'll check it out, but Axl's had me waiting so long I've lost interest. As I was growing up, I heard occasional songs by Jimi Hendrix on the oldies radio stations my folks often listened to, most notably "Purple Haze" & "Foxy Lady". It would be many years before I would actually add some of his music to my CD collection in college. However it is never too late to get into Hendrix! His music, songs and innovative guitar techniques are timeless, and will always sound fresh & cutting-edge no matter how many times you hear them. The only disappointing thing about Jimi is the fact that he left us way too soon. May he rest in peace. His legacy, however, is immortal. As long as there are guitars that come with amplifiers, Hendrix will always be an inspiration for every generation to come. Trivium are a newer metal band that I took too long to discover. I kept hearing their name mentioned in magazine articles and interviews. Most notably, I read an interview with Iron Maiden, and they kept speaking very highly of Trivium. I made myself go to a Barnes & Noble store, and preview The Crusade on one of their listening stations. I was not dissapoinetd. They aslo had a song on one of those sample CDs they now include in a lot of Metal magazines. The song was "Entrance of the Conflagration". 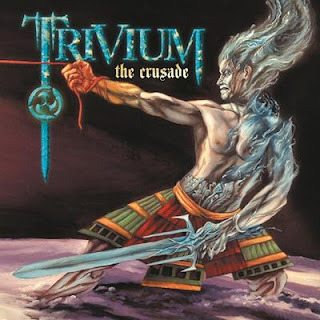 Finally I had to give in and buy their newest CD, The Crusade. It was one of the best choices in music I've recently made. These guys are pretty much classic heavy metal: Heavy riffs, plenty of guitar solos, and a good gravelly voice. I'll always consider James Hetfield of Metallica as the ideal metal singer. His voice is the standard I compare others to. Like Hetfield, Matthew Kiichi Heafy sings & plays guitar in this band. He is also the closest I've hear to Hetfield's voice in a long time. I think only John Bush of Anthrax comes closer. In fact, when I first heard the beginning of "Unrepentant", I did a double-take thinking I was listening to "Through the Never" from Metallica's Black Album. All throughout The Crusade I was bludgeoned over the head with awesome song after awesome song. It is an aptly named CD, like a crusade to reclaim the glory of heavy metal. Right before the closing song, I was beginning to think what a shame it is that metal bands don't write instrumentals anymore. I was thinking that this band is good enough that they could probably write an awesome instrumental. Oh, well, I thought. Too bad it's not the mid-80's in the height of Thrash-metal anymore. Then "The Crusade" came on. I was banging my head with gusto, thinking this would make a great instrumental, if they just kept rolling with it, then braced myself for some lyrics (not that I'd be dissapointed, after all this guy's voice is really awesome for metal!) I kept waiting... The lyrics never came. Instead I was treated to an instrumental masterpiece over 8 minutes in length, the likes of which I hadn't heard since Metallica's "To Live is To Die", or "Orion". The "Hair-Metal" Era of the late 80's/ early 90's will always hold a special meaning for me, because this was the era when I first got into hard rock & heavy metal music. There were a ton of bands around who all seemed to have a big hit on MTV and your regular hard-rock radio station. Half a decade later, they were all nearly forgotten, and regarded as a bad fad that couldn't have ended too soon. There was never a period of rock music where guys looked more like girls than in the height of Hair-Metal. The first song of theirs I heard was "Girlschool". The video for this song got plenty of air play on MTV in '88, and myself being 13 at the time, the song appealed to me. They also had a follow-up video for "Long Way to Love". I never understood why the hair-metal bands dressed so feminine, & wore make-up & hairspray, but I always liked the music. Their 2nd album, Boys In Heat, was not as big of a hit, and didn't have as many songs that really stood out. Britny Fox really continued their decline on their 3rd effort, Bite Down Hard. Nonetheless, there are some good rock songs to be found among these albums, and I'll tell you the ones I would deem worthy of a quick download.